WASHINGTON -- Lesbian, gay, bisexual and transgender employees were 23 percent less likely to be called back for interviews with federal contractors when compared with similar -- but less qualified -- non-LGBT applicants, according to a new study. The Equal Rights Center and Freedom to Work conducted a study using fictional pairs of resumes to apply for 100 jobs with eight federal contractors. One resume listed an applicant's leadership role in an LGBT organization, and one listed a role in a non-LGBT organization, such as an environmental or women's rights group. The LGBT applicant, however, was designed to be stronger in numerous ways, such as a higher GPA and stronger work experience. The stronger resumes, however, weren't enough; the LGBT applicants were less likely to receive a follow-up request for an interview. It's not clear why the LGBT candidates did not receive follow-up interview requests -- whether it was because of their activism in gay rights causes or perhaps due to other reasons. But the organizations in charge of the study were troubled by the findings. "Despite significant progress in advancing civil rights and equality, employment discrimination remains a persistent barrier for the LGBT community," said ERC Executive Director Melvina Ford. "The results of this investigation show that LGBT applicants face discrimination when seeking employment with federal contractors, even when compared with less-qualified candidates." The study, which was conducted from December 2012 to December 2013, comes as President Barack Obama gets ready to issue an executive order that would bar federal contractors from discriminating on the basis of sexual orientation or gender identity. Response to Obama's recent announcement from the federal contractors who don't have internal policies protecting LGBT workers has been relatively muted so far. While the overall findings of the ERC/Freedom to Work study are new, the groups had already released one of the most jarring examples from their research. 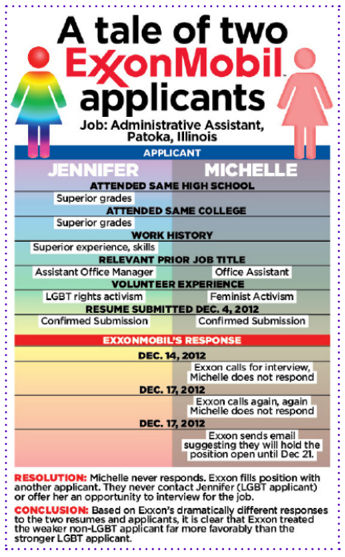 In December 2012, "Jennifer" and "Michelle" applied to ExxonMobil, which does not have sexual orientation and gender identity protections. The two had nearly identical backgrounds and experience, with the exception that Jennifer had better grades, superior experience and a history of LGBT activism. Only Michelle, however, received a request for an interview. In 2013, Freedom to Work filed a complaint with the Illinois Human Rights Commission arguing that ExxonMobil violated a state law prohibiting LGBT discrimination. "Taxpayers should never have to subsidize the kind of anti-LGBT discrimination that was uncovered during this year-long study of contractors with inadequate LGBT workplace protections," said Tico Almeida, founder and president of Freedom to Work. "President Obama’s upcoming executive order will send a strong message that government contracts should be staffed with the highest qualified job candidates, and nobody should ever lose out on a career opportunity just because of who they are or whom they love." In April 2012, the Williams Institute at UCLA School of Law found that 86 percent of the top 50 federal contractors prohibited discrimination based on sexual orientation, and 55 prohibited gender identity discrimination. Last year, the Senate passed the broader Employment Non-Discrimination Act, which would bar LGBT workplace discrimination nationwide for businesses with at least 15 employees. The House has not yet taken up the legislation, and Speaker John Boehner (R-Ohio) has not indicated that it will do so anytime in the near future.